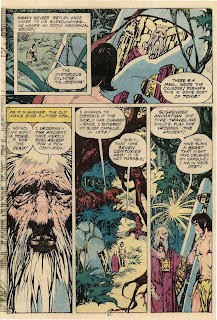 Diversions of the Groovy Kind: Addicted to Alex Nino: Korak, Son of Tarzan in: "The Ancient Awakes!" 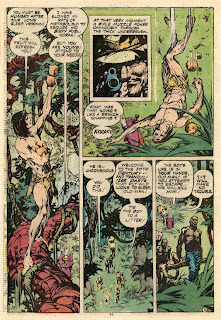 Addicted to Alex Nino: Korak, Son of Tarzan in: "The Ancient Awakes!" 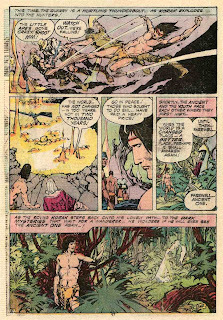 When Korak, that's Tarzan's son, don'tcha know, had his own DC mag in the early 1970s, it was usually drawn by folks like Frank Thorne and Murphy Anderson. 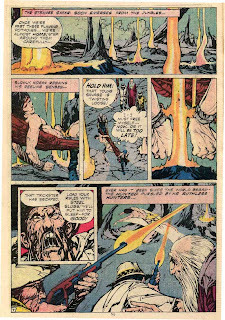 When DC began experimenting with their 100 page format in 1974, one of the things they did was cancel Korak with issue #56 (December 1973) and run his strip as a back-up in his daddy-o's mag beginning in issue #230 (January 1974). 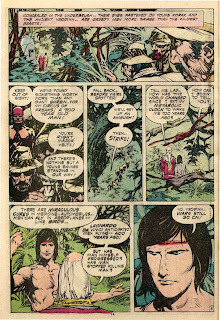 In Tarzan #'s 231-234 (March-September 1974), the art chores on Korak were handled by the man of the hour, Alex Nino. I think you're gonna dig the results. 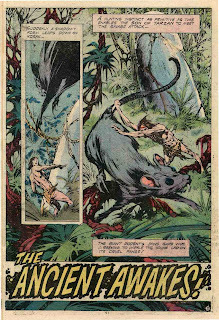 From Tarzan #231, here's "The Ancient Awakes!" written by Robert Kanigher. thank you so much for posting this. as you know i am ALEX NINO obsessed. recently i was looking into buying these issues, but they were all in the $15 to $25 range. 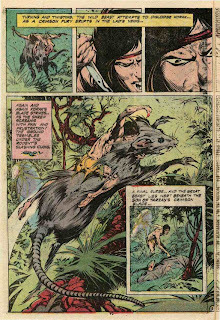 i can't afford to spend that for 8 pages of KORAK. however, i am totally diggin' this strip. 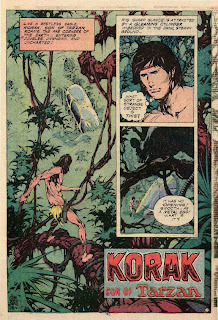 if you have them, i'm putting in a request to please post the KORAK stories from 232, 233, and 234 at some point. if not that's cool. sounds like you have some awesome nino coming up either way. FYI, there will be an exhibition of Alex Nino's original pages for 1984/1994 (the Warren sci-fi comic magazine, which featured his most original and experimental work) this coming November (Nov 4-30) at Kingsborough Community College [2001 Oriental Boulevard, Brooklyn, NY 11235]...If you're familiar with Alex's "God of the Month" story, it will be included in the show (it is comprised of five separate panels that fit together to create one enormous, mind-blowing image. In addition to this and another five-panel work, the exhibition will offer another 35-40 original pages. Information about the show, and some of the illustrations, can be seen at the facebook page set up for "Fans of Alex Nino"
I know she was rescued in the serials, but I HATE when comics get cancelled in mid-story.